We’d love your help. 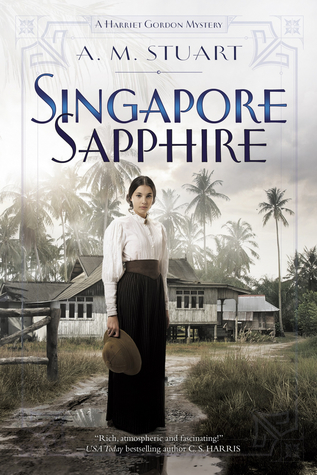 Let us know what’s wrong with this preview of Singapore Sapphire by A.M. Stuart. Harriet Gordon stumbles into a murderous web of stolen gems and cutthroat thieves as she runs from her tragic past in an enthralling new historical mystery series set in early twentieth century Singapore. Singapore 1910--Desperate for a fresh start and to distance herself from her tragic past, Harriet Gordon finds herself in Singapore at the height of colonial rule. Hopin Harriet Gordon stumbles into a murderous web of stolen gems and cutthroat thieves as she runs from her tragic past in an enthralling new historical mystery series set in early twentieth century Singapore. Singapore 1910--Desperate for a fresh start and to distance herself from her tragic past, Harriet Gordon finds herself in Singapore at the height of colonial rule. Hoping to gain some financial independence, she advertises her services as a personal secretary. It is unfortunate that she should discover her first client, Sir Oswald Newbold--explorer, mine magnate and president of the exclusive Explorers and Geographers' Club--dead with a knife in his throat. To ask other readers questions about Singapore Sapphire, please sign up. My favorite new mystery series! Set in a unique and compelling setting, and filled with fascinating historical research, deft characterization, and thrilling suspense, readers will devour Singapore Sapphire. One of the best books I’ve read this year. I can’t wait to read Harriet’s next adventure. This review has been hidden because it contains spoilers. To view it, click here. I enjoyed this historical mystery set in early 20th century Singapore. The characters ring true to the time period, and I think the non-white characters may suffer lack of detail because of that. The idea of the Geographical Society was neat- one had to have a landmark named after oneself in order to belong. It seems like just the kind of thing that colonial Englishmen would do. I liked the two protagonist characters- they possessed the British virtues of stiff upper lips and honor, but weren't s I enjoyed this historical mystery set in early 20th century Singapore. The characters ring true to the time period, and I think the non-white characters may suffer lack of detail because of that. The idea of the Geographical Society was neat- one had to have a landmark named after oneself in order to belong. It seems like just the kind of thing that colonial Englishmen would do. I liked the two protagonist characters- they possessed the British virtues of stiff upper lips and honor, but weren't sticks in the mud. For whatever reason, I love the British stiff-upper lip thing no matter how unhealthy it would be in reality. I also liked the fact that the main characters were cognizant of the fact that not only had a white man been murdered, but his Singaporean servant as well, and they wanted justice for both. A well composed mystery that will take you to Singapore during the early 20th century when it was very much a part of the British Empire. The story will transport you to a time and place you can only imagine. I felt as if I could feel the oppressive heat and humidity in addition to smelling the various odors that were described so vividly. The mystery was well defined and easy for the reader to follow. I have rated the book 4 stars and would recommend to any who enjoys a period tale. I voluntarily A well composed mystery that will take you to Singapore during the early 20th century when it was very much a part of the British Empire. The story will transport you to a time and place you can only imagine. I felt as if I could feel the oppressive heat and humidity in addition to smelling the various odors that were described so vividly. The mystery was well defined and easy for the reader to follow. I voluntarily read and reviewed an advanced copy of this book. All thoughts and opinions are my own based on my unbiased review. A very enjoyable mystery set in a part of the world I did not know much about. Harriet Gordon is an interesting new heroine who I enjoyed as a realistic and yet brave woman trying to rebuild her life in Singapore following tragedy in India and as a suffragette in London. She's given a fabulous partner in Inspector Robert Curran. Could I also just give a hat off to the author who has, so far anyway, made it clear this is a friendship and not a romance? The plot moves along nicely and never drags A very enjoyable mystery set in a part of the world I did not know much about. Harriet Gordon is an interesting new heroine who I enjoyed as a realistic and yet brave woman trying to rebuild her life in Singapore following tragedy in India and as a suffragette in London. She's given a fabulous partner in Inspector Robert Curran. Could I also just give a hat off to the author who has, so far anyway, made it clear this is a friendship and not a romance? The plot moves along nicely and never drags (a rarity lately so I very much appreciated a story that kept moving forward). I did figure out the one villain but not the second so I enjoyed that surprise and I very much enjoyed a few of the other small twists as the mystery resolved itself. I especially enjoyed the detail the author shared of the time and place of the story. Singapore of 1910 truly came alive on these pages along and with it a cast of characters I am looking forward to seeing another mystery from in the future. An engrossing historical mystery with an exotic setting. I'm looking forward to the next in the series. *Thanks to the publisher and NetGalley for providing an e-galley in exchange for an honest review. In her life outside writing, she enjoyed a varied career as a l Australian author, A.M. Stuart, began her writing career half way up a tree in the school playground where she wrote her first (unpublished) historical romance. She now writes historical romance as Alison Stuart (a Goodreads author).